The What: hearTV has released it’s first product, the hearTV audio streaming transmitter, for nationwide availability. 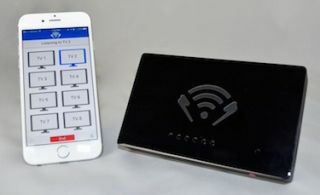 Businesses connect the transmitters to their TVs and consumers are able to stream live audio to their smartphones via a free app available for Android and Apple users. The Bottom Line: The system pricing starts at $249 and is a one-time purchase with no subscriptions or other requirements. “We’ve solved a major pain point for both establishments and guests. The days of establishments featuring multiple TV monitors, but forcing customers to listen to the audio from one TV are over. With hearTV, nobody is shortchanged,” said Dennis. Guests using an iPhone or Android download the free hearTV app from the App Store or Google Play, join the hearTV Wi-Fi hotspot, launch the app and can listen to their desired program.